Happy New Year…. a little late, we know, but the sentiment still counts. We’ve raced into the New Year head on and still strong. BritsBrand continues to thrive with bookings coming in and parties being planned. Meetings with the ‘Bride’s to be’, event planners and party organizers, this year is set to be our best yet. Thanks to our fantastic friends at Bella Luna Gifts, in Morris, we were able to offer our fabulous Christmas Hampers to our lovely clients. We know our traditional Christmas crackers, beautifully decorated many Christmas tables, filling their recipients with delight as they ‘pulled their cracker’ to reveal their prize on Christmas day. We introduced the folks of Connecticut to our British Selection boxes and Christmas puddings…. sharing our hometown British traditions with so many. ‘It’s what we do’ and it makes our hearts happy to know that we can bring these traditions to our little corner of the world. So, as we head into the New Year, we hope that it brings every bit of happiness you wish for and that your blessings are abundant. We hope we get to share a brew with you at some point this year, whether it be at Bella Luna or at one of our many events coming up. Until then, our best wishes to all of you for a peaceful, safe and very Happy 2019! Small Business Saturday is an American shopping holiday held on the last Saturday in November. The first one was sponsored by American Express and was held November 27, 2010 to encourage shoppers to start off their holiday shopping in small and local establishments. Where else would the Brit Girls be on such a special day…. at Bella Luna Gifts in Morris of course! We knew it would be an amazing day, after all…. we were there last year and it was fabulous. The store opened early to a flurry of customers wanting to get a head start on their holiday shopping. Sounds of Christmas entertained the guests in the form of the ever amazing Grace Nield, the talented cellist. Others were treated to free massages by Rita Lombardi. Tea, coffee and European style lemonade was served as well as our famous scones with clotted cream and jam as well as Auntie Pat’s mince pies getting everyone into the Christmas spirit. I caught Dave, the owner, just watching everyone busy shopping, chatting and visiting their favorite place. I know last year Dave and Anita stood watching with tears in their eyes at how Bella Luna Gifts had been welcomed into this town and community. I don’t think they every dreamed this year could be better than last, but they were wrong, it was bigger, better and made them smile even more! When you live away from your family and friends it’s hard to recreate the spirit of the holidays you grew accustomed to. Growing up in England you had the markets, the late night shopping the works’ ‘do’ and the never ending family dropping in for a brew and a mince pie (sometimes something stronger…. for medicinal purposes of course) to start off the celebrations each year. Unless you find yourself in a city here in the USA, you miss the hustle and bustle of the main street….. but Bella Luna Gifts is our little slice of this. Dave and Anita have worked hard to create not only a unique gift store but a destination. Not just a place to find that special gift, but a place to meet friends, come for a chat or pop in to see Charlie the dog! It’s calming, quaint and relaxing. You’re always welcome no matter what. I walked out of the store the other night and looked back on the beautiful window displays, ever so carefully set out by Anita’s sister Grace, and thought,,,,”this is it…. it’s just like back home” So, if you haven’t already, do yourself a favor and stop in. You’ll love it! Good morning Brit fans. Hope you’re managing to keep up with this ever changing New England weather. One week we were sunning ourselves in Woodbury at the Fall Festival and the next we’re up to our shins in mud at the Hopkins Vineyard! Either way we always have a good cuppa brewing and some fantastic baked goods ready to cheer you up! Last weekend really was a blast. If you’ve never visited the Hopkins Vineyard you really don’t know what you are missing. No matter which route you take to get there you will be stunned by the scenery, no matter what the season. Last weekend, despite the rain, visitors were treated to a beautiful display of Fall colors all around. A bonfire was roaring while the band played and despite the rain everyone had a great time. We were kept warm, not just by the copious amounts of tea consumed, but by the never ending warmth from the people we had the pleasure of meeting. My favorite part of the afternoon came in the form of a comment from one of the guests (sorry Tilden’s your fish tacos were to die for but…) “these are the best scones I have ever tasted”. For our little company, comments like these mean everything. We started as 3 friends throwing out ideas and coming up with solutions and it’s turned into a thriving little business that can only go from strength to strength. That very same day Deb got to spend the afternoon at the gorgeous salon Byrde & the b. Joined by the owner Scott Bond, multiple Emmy award winner and nominee, and Justine Hoagland with CLOTH clothing, guests were treated to an afternoon of shopping for beautiful children’s clothing while they enjoyed a spot of tea and a scone or fairy cake. This salon is amazing. Decorated with antiques and a unique flair, it offers everything you could want in a full service salon. So while Ali, Clare and Hannah were sloshing about at the Hopkins Vineyard, Deb and Deb were nice and cozy in the luxurious surroundings that spell out star treatment from the moment you walk in the door. Hello everyone! Hope you've all had a great Summer! It's been a while, I know, but we are back. It's been a great summer full of adventures. The Brit girls have been busy working on some fabulous projects. From beautiful favors, to fantastic themed teas, it's been so much fun! The Summer months saw our innovative Breezebreakers find their way to a wonderful store in the Cape. Check them out at Cape Tradewinds in Orleans, MA. We served up our treats 1950's style at the Litchfield Community Center for their annual Summerfest Gala. Our beautiful favors graced many celebrations this Summer too. From beautiful covered jam pots to our lovely Yorkshire tea favors. Thank you to all who chose to include us in their special occasions. Always thinking of ways we can use our beautiful china, when it can no longer grace our tables, we decided to re-purpose them to make gorgeous bird feeders and candles. Check these out at Bella Luna Gifts in Morris on September 23rd where we will be holding a 'Pop in and Paint' day and later this month at the Woodbury Fall Festival on Sunday, September 30th. This might just be a record-breaking month for the most scones ever baked!!! We've been hard at it at the Mindful Kitchen today, busy prepping for our second year at Savor Litchfield. Over 500 scones are ready and waiting for guests to enjoy as they sample all the wonderful delights Litchfield has to offer. Join us tomorrow at South Farms in Morris, there might be a few tickets still available. Well guys, it's been awesome, so awesome we've not had time to 'blog' we've been so busy! Looks like Fall is finally here, so enjoy these beautiful Fall days and all the amazing colors nature has to offer. Hold on tight BritsBrand fans....... it's going to be crazy ride!! What a weekend! If you're British or just a fan of the British monarchy, this weekend was a weekend to make us all proud. 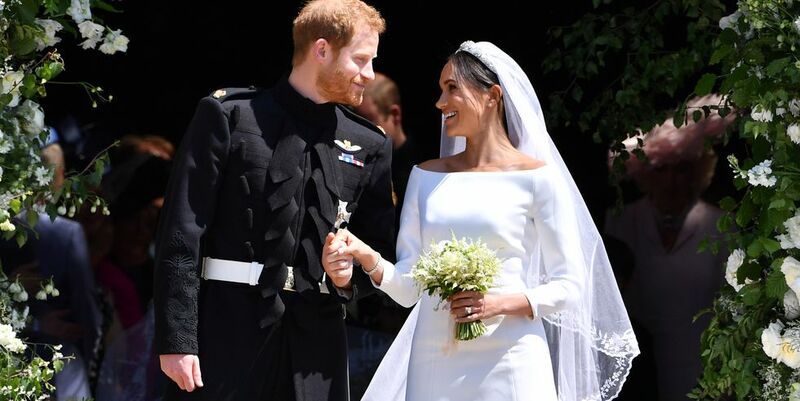 Our very own Prince Harry married his sweetheart Meghan in the most beautiful ceremony that broke many traditions and spoke volumes to people all over the world. In true Brit Girl style we celebrated as any Brit would - at the pub! While serving a full English, on a bun, we watched the happy couple share the vows. Yes, the upstairs event room at the Village Restaurant, Litchfield, was the place to be! As good friend of ours said "Meghan has showed little girls all over the world that anyone can become a princess". The whole day just spoke 'new Royals'. A gospel choir sang Stand by Me, and a young cellist by the name of Sheku Kanneh-Mason gave a breath-taking performance which will be remembered for years to come. I could go on and on. The day was amazing and the Brit Girls will be watching and re-watching with many a glass of fizz in the coming weeks. It just made us feel good and proud to be British. Here's to the happy couple, we wish them nothing but happiness. It was all things Downton today in Burlington, CT. The Brit Girls brought a little slice of England to a beautiful venue and served an afternoon tea fit for any lord or lady. Guests dined on a variety of delicate tea sandwiches and scrumptious desserts, topped off with hot British tea and European style lemonade. The guest of honor looked fabulous in her 1920's style attire and everyone joined in the fun and wore Royal worthy hats and jewels. A table fit for Lord and Lady! What a discovery! Pure Love Bakery in Avon, Connecticut will now supply gluten free products for any of our guests with dietary requirements. Before Christmas we sampled some of their bakery delights and just loved them. We served up these gluten free versions of our own tried and tested favorites at a baby shower over the Christmas holiday and everyone was delighted! Here are just a few pictures of these delicious delights! Gluten free scones served with homemade clotted cream and strawberry jam. We are thrilled to announce that our lovely products will be available exclusively at Bella Luna gift store in Morris, CT. We were asked to sell our baked goods and home made products there over the festive period and it was so successful we will now have our very own 'spot' right in their store, year round! Come and look at our beautiful handmade table runners, place mats and gift baskets. As always stock up on your favorite teas and jams too! Stop by for a spot of tea and a biscuit and watch out for our famous scones, millionaires shortbread and mince pies on sale on select dates in the future. We have lived in this beautiful area of Connecticut for many years but only this week discovered the beauty and delights of All-Wright Acres farm in Bethlehem. Nestled among the Abbey of Regina Laudis this beautiful property is home to Karyn Wright and her family. As we went down the driveway we truly felt like we were entering a little piece of England. Karyn and her friend Donna showed us around the house and property which features the Bethlehem Bunkhouse, a beautiful barn, pool, farm and gift store as well as home to Karyn's home made products creatively named The Hippie Chicks. We shared our scones, clotted cream, jam a lovely brew in Karyn's gorgeous dining room as we discussed and planned for her annual Christmas Sale to be held November 24th. This is how we do business, over a brew and a scone!!! A British girls' Guide to dessert - Millionaire style! We had the pleasure of bringing our British flair to the Palace Theater in Waterbury. A perfect compliment to A Gentleman's Guide To Love and Murder. After hours of baking we served over 1000 "Millionaire's Shortbread" delights to the guests of the theater. Here we are the Warren team for the day! A beautiful event at a beautiful location. Guests dined on a traditional British afternoon tea as they danced away the afternoon to the sounds of the 40's. Lots of new fun breeze breakers! So sad summer is over! Of all the breeze breakers we made this summer, this was one of everyone's fav's. More Breeze Breakers being made every day! Here is the latest model, special order ! Full pics on the beach to follow.